5-Piece Twin Size Bedroom Set. 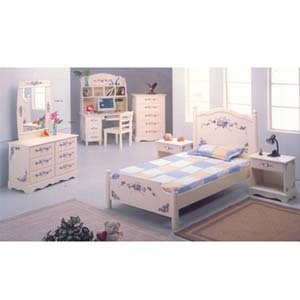 Includes Twin Size Night Bed (Head Board, Foot Board, Rail). Night Stand Size, 21x15x24. Mirror Size, 28 x 1 1/4 x 39 3/4H. Drawer Size, 42x18x30. Chest Size, 30x16x48. Optional (Not Included In The Price) Computer Desk Size, 44x28x30. Computer Desk Hutch Size, 42x12x40. Chair 19x20x35. Strong Construction. Easy To Assemble. IEM7117.